The yarn itself is coming along pretty well... though I guess you might call it "thread" over yarn really. 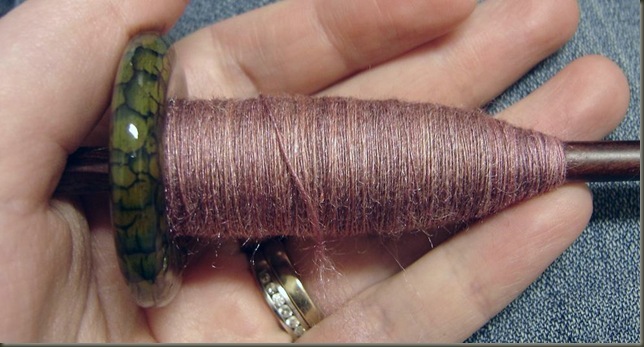 My first spindle full was 17g and yielded 170 yards of nice fine 2 ply. I decided I would do a smaller amount to test first and make sure it was turning out as planned. I hope to be able to put a bunch more on for the next couple of skeins... maybe as much as 40 - 50 g before winding off? If the calculation holds true, I should be able to get 900 - 1000 yards from this 112 g braid - which should be lots and lots! Normally Laminaria is knit from a regular laceweight yarn on size 3.5 - 3.75 mm needles. Since my yarn is a bit finer, I decided I would use slightly smaller needles (my 3 mm Woody Knitters Needles to be exact) that way the finished piece wouldn't be too airy. I really like the way the wood needles grip the thread, and creates such a nice feel for the knitting process. I know if I was working on steel needles I'd knit tighter, so I figure that my loose knitting on the smaller wood needles shouldn't be that bad. Either way, I'm going to have lots and lots of yarn (the original large pattern only calls for 600 ish yards of yarn) so if the shawl isn't looking big enough when I reach the point where you normally switch to the border transition... I'll just do more repeats! How's that for knitting on the fly? The spinning itself is taking place on a Zebisis stone whorl spindle... I've never actually weighed it though, so I can't tell you the exact weight. I'd say it's around 1 ounce, based on behavior and comparison to my Golding. It took a little practice to get used to working without a notch in the whorl, but I think I've gotten the hang of it now, and the yarn is fairly consistent. 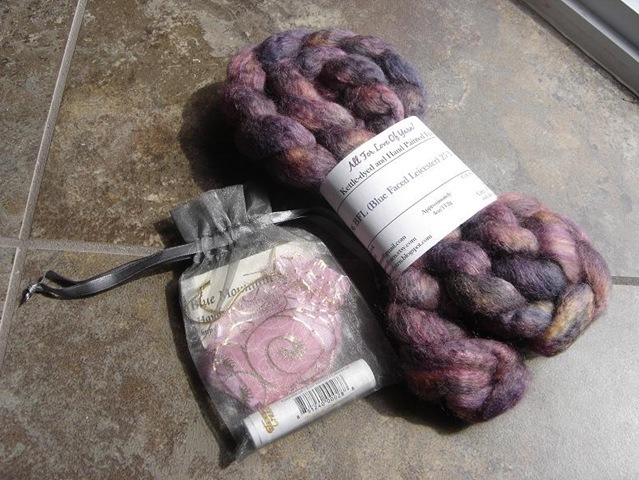 The second cop is in progress as my current travel spinning project. I've been working on it during lunch break and when waiting. I had better get going on it though... the first 170 yards has almost been knit up! I've completed the first section of the pattern: the star stitch portion. 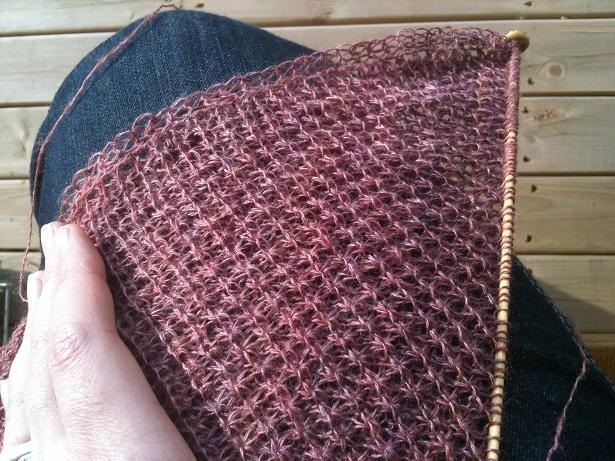 I like the texture of this stitch, though I bet it will flatten out a lot during blocking. I'm finding the yarn size vs needle size to be satisfactory so far. This stitch pattern is supposed to be more dense than the lacy open part... so I guess I won't know until I get some lacy bits whether I will be completely satisfied. I've gotten over half of the transition section done, but that's mostly just more star stitch. Hopefully tonight I will be able to progress more into the flower lace section and see how that's going to look! Purple Moth BFL/Silk Blend... taking flight! Trying out a new fiber blend, and a new-to-me spindle! I started yesterday on the shiny rich braid of BFL/Silk that was eating a hole in my stash... I guess I just felt like the day needed something like a new project. After waiting for several months (stupid PEI Weather, and the Stupid Frostline) we were finally able to have Grampy's Burial Service yesterday. I knew I would be sitting around most of the day with family... and I knew how much having a good spinnable-companion might help my stress level and concentration. In case you forget what the Braid looked like: Here she is! 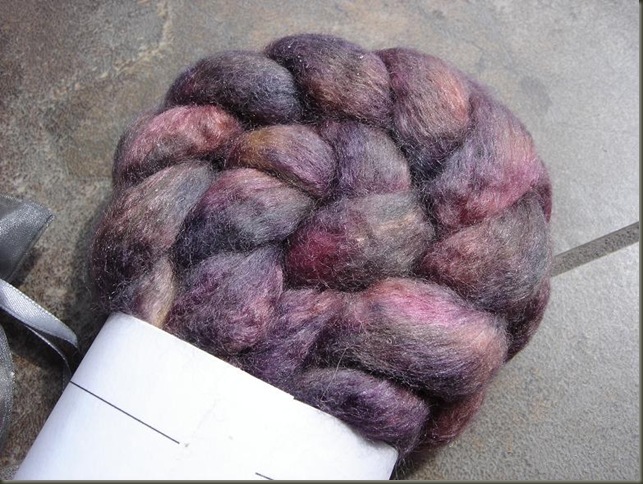 Purple Moth, a shiny blend of jewelled tones of pink, purple and gold from AllForLoveOfYarn over on etsy. 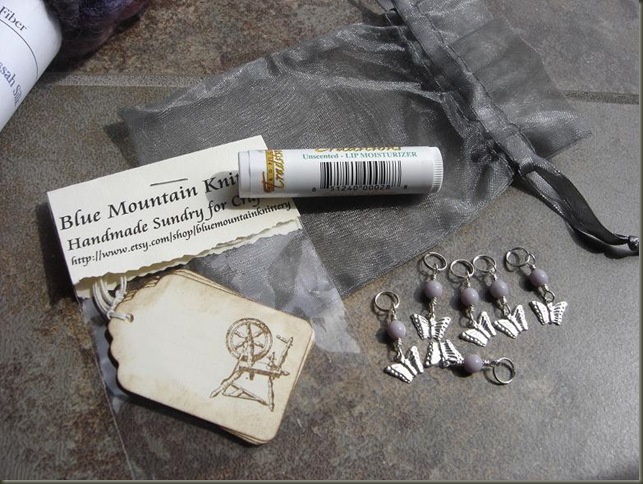 The spindle is a Zebisis Stone Whorl that I picked up on a destash a while ago... I think the stone is Spiderweb Agate, which is a little ironic since I am quite ridiculously afraid of spiders. sigh. It weighs around 1 ounce, just right for a fine silky fiber. I had to adjust the hook a little, but overall, I am enjoying this spindle quite a lot! I'm debating leaving this as a single, or perhaps plying... yet to be decided, I guess... any opinions or comments? Some time ago... 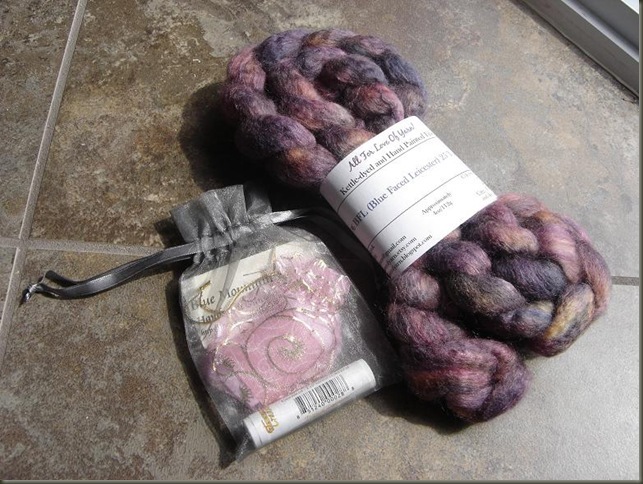 I was tempted by a neat new fiber club from AllForLoveOfYarn - basically a club with a 4 ounce braid of some fibey-yummies and some other toys and gifts to match! I've always been pleased with purchases from this company, and this club kit was no exception! 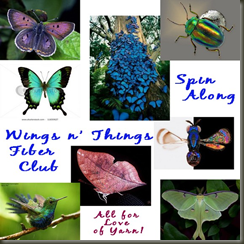 They are also hosting a spin-along with the fiber, where you are entered to win prizes and such. I am enjoying seeing what other people make with the same braid of fiber! It's amazing how creative and unique we can all be when it comes to this sort of thing. And here are the goodies! Butterfly Stitch markers... with pretty matched lavender beads, some yarn tags, perfect for recording details about that precious handspun skein, and finally some natural, organic, beeswax lip balm. Perfect for a little lip pick-me-up.